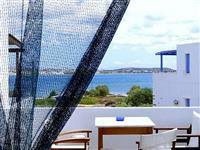 The studios are at an unspoilt areaclose to the sea near a golden beach with a panoramic view of the fishing harbour, the open sea to the east and Paros to the north. The nearest village is around a ten minute stroll away along the water's edge. There are various beaches nearby, such as the windless and tranquil Agios Spiridonas beach. There are 2 one room studios for 2-4 people. Each one has a bathroom with a shower, television, air-con, kitchen/dining area, a furnished veranda and sea/garden view. 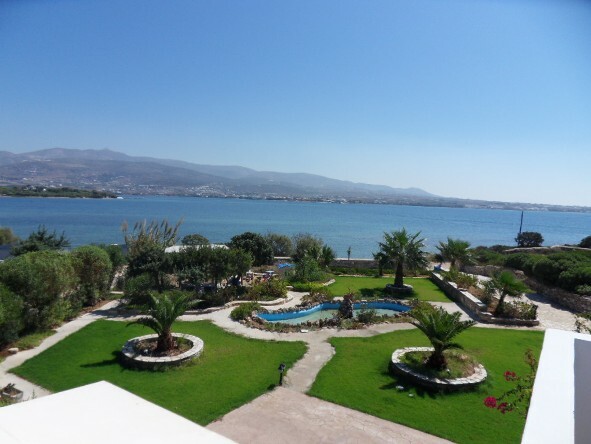 There are four 2 roomed apartments for 2-3 people, with a private bedroom, bathroom with a shower, television, air-con, kitchen/dining room and a sofa bed for one person, a furnished veranda and sea/garden view. 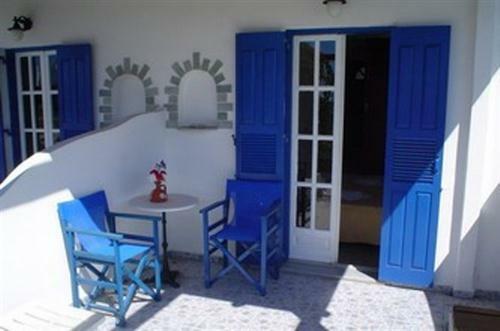 There is a larger two roomed apartment for 2-5 people with a private bedroom, bathroom with a shower, televison, air-con, kitchen/dining room and sofa bed for two people, plus a furnished veranda with a sea/garden view. The building is well maintained and of a good quailty. Price and location make these very popular so we encourage you to book early. The studios and apartments are cleaned everyday. The bed linen is changed twice a week. Antiparos is a charming island with the town of Antiparos (the capital of the island) built around a Venetian castle.The most remarkable feature on the island of Antiparos is a cavern with stalactites on the south coast. It is reached via a narrow passage broken by two steep and dangerous descents which are accomplished by the aid of rope-ladders. The grotto itself, which is about 150 feet wide and 50 feet high features many remarkable examples of stalactite formations and incrustations of dazzling brilliance. Although the cavern is not mentioned in ancient writings, there is, however, an inscription recording the names of visitors in ancient times at the entrance. Accessible areas of the cavern walls are covered with graffiti, some of them beautifully lettered, recording visitors during the 18th and 19th centuries: these include royalty and other well-known tourists alongside geologists and engineers. There are plenty of beaches on the island, but the biggest one is Psaraliki. 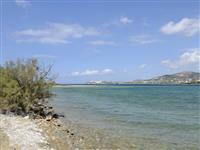 There are two beaches called Psaraliki, the first and the second, but the first one is the biggest and attracts the majority of the island visitors. Between the beaches lies the"Fanari beach club" and beyond the second lies the "Time Marine beach club" There are also other beaches and restaurants on the island, but they are harder to reach, although you can take the bus to them from the port. 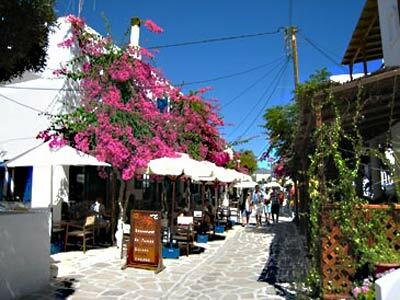 The square in Antiparos is the central meeting place, and this is where most of the night clubs and bars are situated. Antiparos is an island in the Cyclades in the Aegean Sea, separated by a strait (about 1-½ miles wide at the narrowest point) from the west coast of Paros: the boat trip is just ten minutes from Pounda, a little port on Paros which can be reached by bus or taxi, and about twenty minutes from the main port in Paros, Paroikia. The island's seashore is 57 kilometers long and the population is about 900, most of whom live in the capital and are employed in agriculture and fishing. 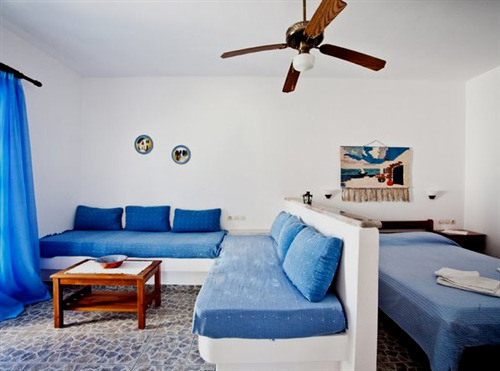 Anitparos is a jewel of an island with friendly locals, endless sunshine and beautiful unspoilt beaches which will make the visitor want to return again and again. Prices are for 2 people. Studios can accommodate up to 3 people. For the 2 roomed accommodation for 2 - 3 people the price is for 2 people and the cost for an extra person is 20% of that price. 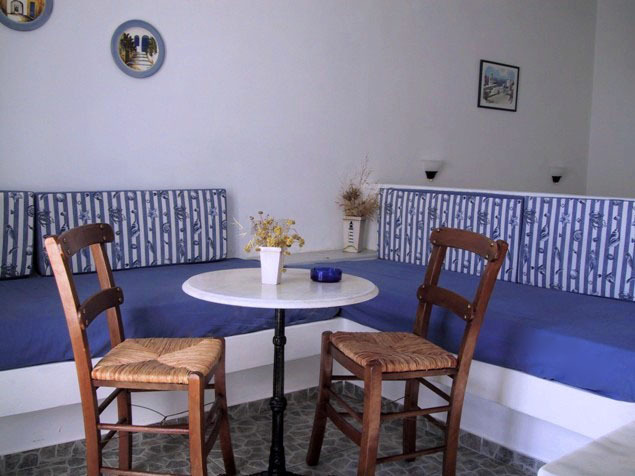 For the 2 roomed accommodation for 2 - 5 people, the price is for 2 people and the cost for each extra person is 20% of the price for 2 people. Price per extra person is 20% of the price for 2 people. Notes: There are different layouts for the studios according to how many it sleeps. These are cobinations of double beds, singlebeds and sofa beds. Please see the idividual discriptions to find one suitible for your party.